This tranquil, affordable adults-only resort makes for a perfect romantic escape, even for those on a budget. Located in the pristine Yasawa Group, this secluded island paradise offers a white sandy beach, snorkeling lagoon, on-site scuba diving, a great restaurant, and spacious grounds designed for minimal environmental impact. With only 4 deluxe villas and 8 traditional bures, you will never feel crowded here. Traditional Treehouse Bure - Nestled along the hillside amongst the trees. Sleeps 2 guests, either double or 2 single beds. 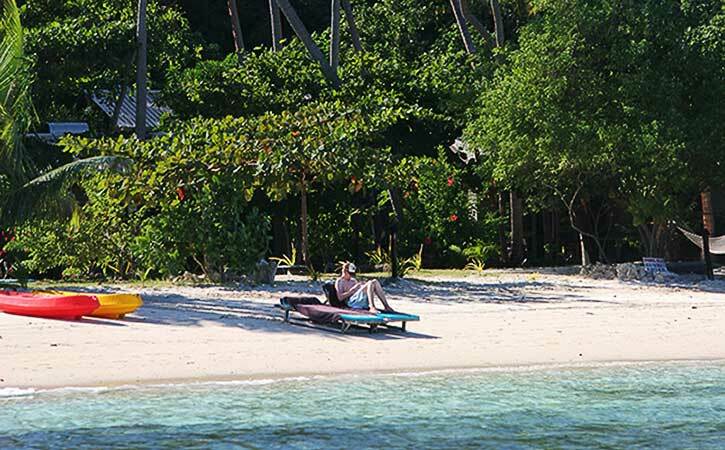 Deluxe Bure - Located amongst the swaying coconut palms with only a short walk to the beach. Sleeps a maximum of 4 guests, – Queen-size double and 2 single beds. Come enjoy the underwater world with Nanuya’s Sister Company, West Side Water Sports. West Side Water Sports, Yasawa diving,Fiji, a PADI International Resort Association member, is a fully outfitted dive centre with a full range of Scuba Pro Dive gear rental gear. Their two custom made Naiad dive boats, a 9 meter open boat and a 11.3 meter covered boat, give quick and comfortable access to 20 dive sites in a 10 mile radius of Nanuya Lai Lai Island. These dive sites offer a wide range of under water topography to explore; walls, canyons, pinnacles, and swim throughs all decorated with colourful soft corals, hard corals, sponges and sea fans. Encounters with sea turtles, reef sharks and majestic eagle rays are common. Guided dives depart daily and are staffed by PADI dive masters or PADI instructors. They also offer a wide range of PADI dive courses from introductory dives through to assistant instructor. Specialty dive courses are available too. West Side Water Sports being a PADI Resort Association member follows the PADI code of ethics. They discourage guests from taking anything from the sea and encourage good diving practices to prevent damage to the environment.